As a child, I don’t remember a day where my mom was not there. I am told my mom had to put me in a home daycare for a week after I was born, so she could transition from day shift to night shift, but I have no memory of that time. I was home with her all day, and my dad was home at night when she had to work. She worked very part time as a nurse on the night shift. She was home with my brother and me all day as a stay at home mom who also happened to work part time nights. She basically did not sleep. Maybe you do it. Maybe you sacrifice your sleep to be present in your child’s life while they are in need of you the most. All moms have to sacrifice for their family. Moms are pretty strong. At times we devalue our motherhood experiences so much because the world tells us that we should not sacrifice too much. Good luck defining too much to a baby who is awake at night with teething pain, or a preschooler who is struggling with wetting the bed and needs you to change her sheets (again) this week. It can feel exhausting to be stretched so thin on sleep or patience or both. We can feel like being present with our children every time they need us is too much to give. Giving is not going to bankrupt our lives. Giving to others does not leave us with nothing in the end. I think about God. I think about all I have received from trying to follow God’s word in my life. God has given me life. He has given me chance after chance. He has given me the people I love the most. He has given me everything. He keeps giving. I don’t ever give God anywhere near as much as He gives me. I have not always loved Him without fail, I have not always followed his Word perfectly. But I believe. I know he is there even when I turn away. There are times now as a mom when He is the only help I have in a tough moment or during a difficult day. Why would God give our children to us if we were not strong enough to give as much as they needed? My mom was there, so I could believe that love, sacrifice, and God, were possible. I had tough challenges as a child. My first surgery occurred when I was 6 weeks old and I have had multiple procedures since then. Never did I have to navigate it alone. My parents were there. Their presence taught me that I could rely on them. Their presence reassured me that I could rely on love. Their presence taught me that believing in an ever-present loving God made sense. Children learn if love is real and reliable from us. The presence of a mother in the life of her child is powerful and much more necessary than this world would have us believe at times. As mothers, our ability to prove that our love is sure and steady is important for teaching our children to believe in something bigger than themselves-to believe in God. The presence of a mother and father is powerful. God has a plan for all of us, and we can help Him by following His guidance. He teaches us that giving will not leave us depleted. 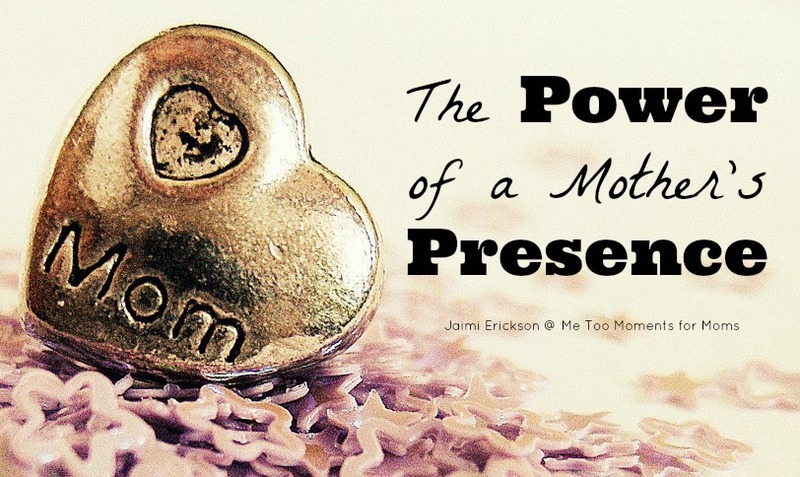 The presence of a mother in the life of her children is powerful. I am teaching my children not only to grow into strong people, but to understand that they do not have to be strong all on their own. They have me. They have a strong God. 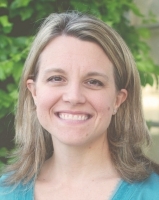 Jaimi Erickson is mom to 4 (2+twins), a military wife and former teacher who works in the home as a stay-at-home mom. Her heart for encouraging moms to realize their importance turned into a blog-The Stay-at-Home Mom Survival Guide-where she shares encouragement, simple kids activities for infants, toddlers, preschool and school age kids, and articles on many mom-related topics. Her goal is to let God lead. She would love to connect with you on Twitter, Instagram, Facebook or Pinterest. “Because Motherhood Isn’t Just a Job. It’s a Calling. Hi Andrea, Great having you here. Thanks for joining us. This is a wonderful community to be a part of. I’m glad to see that this post was just what you needed. It’s awesome to be encouraged and to know that others understand. I understand that feeling that every last inch of me is stretched thin. God see’s this and He is right there for us and that is a great thing. He has us and He will help us.